SUNIX DevicePort® is the ideal choice to enable your current Legacy I/O devices networking. DPKS02HP0 allows users to expand two RS-232 ports over Ethernet connection, and it works as a PCIe add-on card operation on any windows based tiny desktop, laptop, or All-in-one system. With SUNIX DPL2000Q High-Performance Ethernet-UART controller and exclusive I/O redirection technology, DevicePort® creates physical COM ports that support real time data communication and Ethernet-COM port hot-plug capability; user can expand RS-232 COM port easily without complex software configuration that improves deployment efficiency to achieve greater reliability in commercial and industrial automation applications. Expands multiple RS-232 serial ports over Ethernet networking. Works as a PCIe add-on card operating experience with Ethernet hot-plug and system auto-detect capability. Built-in SUNIX DevicePort® DPL2000Q High-Performance controller. – Port auto-mapping with real time data communication. – Physical COM port accessed via device manager. – Up to 12 COM ports working on windows system simultaneously. Accesses tradition COM port by using existing software and AP. Low power consumption design for Green Environment. 15KV ESD protection for all serial signals meets IEC-61000-4-2 standard. Certified by CE, FCC, VCCI, C-Tick, BSMI, RoHS, and Microsoft WHQL approval. 1. To prevent on-line spy recording, DevicePort® Dock Mode limits specific Ethernet port connection, and it does not works on router or switch operation. 2. Ethernet I/O Redirection technology is SUNIX proprietary protocol for COM, LPT, and digital IO expansion over categpry6/5 Ethernet cable. Small PC form factor requirements grow and advance continuously to meet up-and-coming challenges and opportunities. SUNIX DevicePort® products are specifically developed to meet such requirements to replace current add-on card solution. User can expand legacy I/O ports over Ethernet connection that improves deployment efficiency to achieve greater reliability in commercial and industrial automation applications. 2. 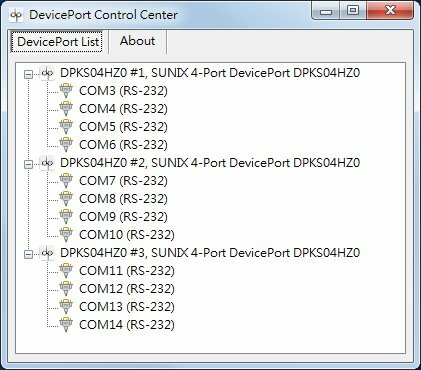 Auto-Detect & Port-MappingWith Ethernet hot-plug and system auto-detect capability, user can expand RS-232 COM and LPT port easily without complex software configuration. Just plug RJ45 Ethernet cable between SUNIX DevicePort® and PC host side, system will create physical COM/LPT ports automatically with real time data transmit and receive communication. User can easily access port by using existing software and application, no longer TCP sock protocol compiling. 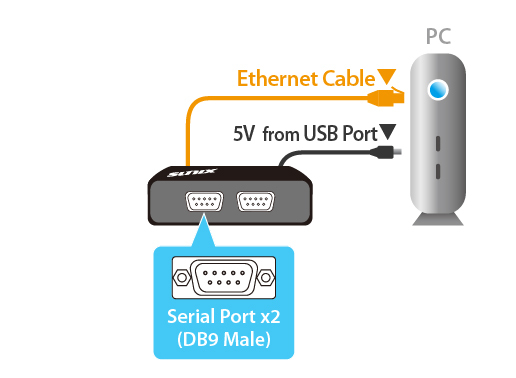 SUNIX DevicePort® product built-in dual 10/100 Ethernet channels, one for data downstream to PC host and the other upstream port for Ethernet switch connecting. With dual Ethernet channels feature, DevicePort® supports daisy chain network topology for multiple boxes connection. (Maximum 4 boxes or 12 COM / 3 LPT ports expansion). SUNIX Powered COM feature can output +5VDC power to serial devices via DB9 COM port ninth pin. 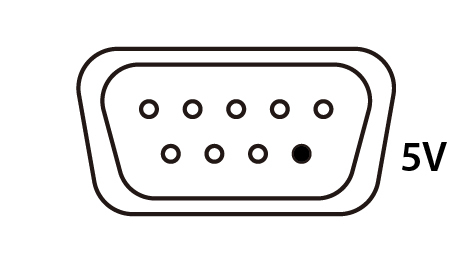 User can enable or disable Powered COM feature by dip switch on the side of DevicePort box. It’s convenient for users connecting serial devices without addition external power supply. Categories: Commercial & Industrial, DevicePort Dock Mode, PoweredCom Series. © 1986-2015 Grupo Sunix. Todos los Derechos Reservados.